Factory Pro, as leaders in quality tuning products and the famous F-USA rated EC997 Eddy Current chassis dynamometer, was instrumental in developing several BMC filters and continues to supply technical feedback for today's and tomorrow's applications. BMC also makes Quad and Offroad filters! The ONLY Factory Pro approved High Flow R1 air filter! Features a high quality, injection molded frame for maximum air filter safety. If I was going to change air filters - It would be to the BMC. What could be better in your R1? 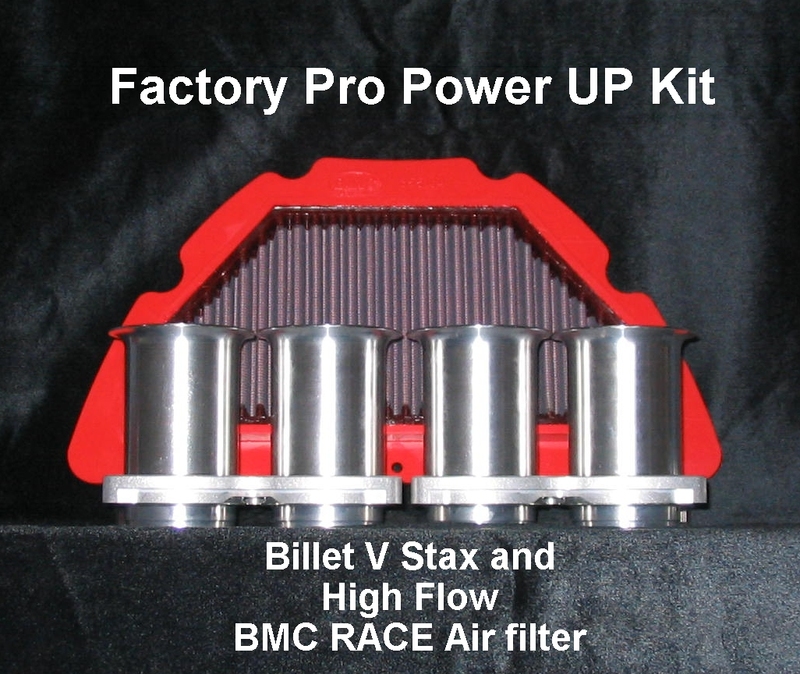 Factory Pro Superflare Stax AND the BMC Race filter nestled in your R1's stock or modified airbox!!! 3-4 True HP Horsepower AND reliability!!! also will make: Transmission Detent Star Kits! Shift action like hot knife through butter! Cleanable, reusable, never buy another stock filter!!! Great for high mileage riders! Carbureted models MUST be rejetted to match! AMA Pro Racing's most popular air filter! The world's best Chip for the Tuono! Based on the highest tuning standard in the Aprilia world, the "1413" Mille chip! The world's best Chip for the Mille! 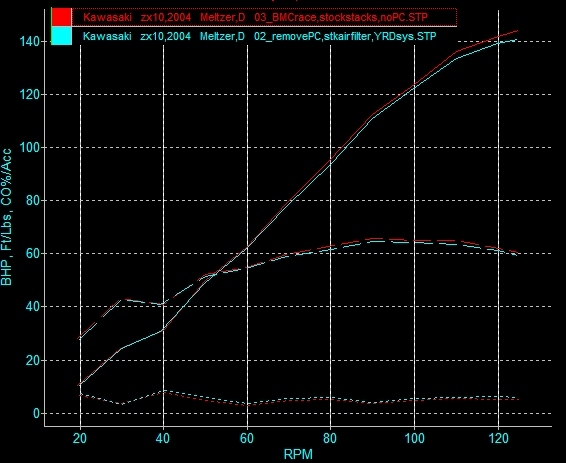 Based onEC997 Eddy Current dyno research - not a bit of tuning was done on dealership level dynos! Available through EC997 dyno equipped AF1 Racing and Evoluzione - The BEST places in the world to perk up your Aprilia! for the Mille and Falco (same engine) !EC997 Eddy Current dyno research - not a bit of tuning was done on dealership level dynos! R 1100 S style If we can make Motorcyclist Magazine happy..
GS / R / RT STOP THE SURGING!!! Custom Chip Tuning in San Rafael, CA. $775 - no tomfoolery or wizbang gimmicks that couldn't possibly address the problem, like TFI or PC and silly intake runners! Custom tuned chip for your bike. GS / R / RS / RT STOP THE SURGING!!! Shift action like hot knife through butter! Custom Chip Tuning in San Rafael, CA. This a complete kit that retains an intake runner filtration system rather than less effective single foam TB filter. Are tuners who test stock bikes on non-dj dynos the only people who find that true? Factory Pro makes the only chip that eliminates the part throttle / high rpm and the full throttle / low rpm poor running that this bike has - It's NOT the "fuel" It's NOT that it's a "racebike"! It can be SMOOTH! Also, Custom Chip Tuning in San Rafael, CA. Factory Pro makes the only chip that eliminates the part throttle / high rpm and the full throttle / low rpm poor running that this bike has - It's not the "fuel" It's not that it's a "racebike"! Also: As of November 8, 2003, we are not tuning the stock ECU - So - you have to use a pc to tune as well as possible. There are cylinder stagger issues that the pc poorly addresses, but, it's the only thing out there that will address the issues well enough so that it runs somewhat OK at both 9500 and 10,500 rpm. The EC997 dyno, tuning to BEST POWER, rather than some fictitious "A/F Ratio" has proven hat it is the best choice for tuning in this application. Add 3 TRUE HP with our new 58.5mm Velocity Stacks! Catch those R6's! 05 The world's most sought after GSXR filter!!! 04 dyno The world's most sought after GSXR filter!!! This kit ONLY works properly with the CRB-S36-2.7-RK carb kit! Other carb kit (i.e. dynojet) attempts will NOT deliver the topend power that the correct carb kit will develop. This kit ONLY works properly with the CRB-S36-3.7-RK carb kit! If you are a qualified tuner (a 1 week dynojet "A/F Ratio "tuner" doesn't qualify), it's possible to SLIGHTLY modify the inlet and be able to improve the flow and pick up 1-2 TRUE HP over the stock filter with matching main jet changes. NO FREE TECHNICAL SUPPORT on that! only This LARGE INLET filter WILL ONLY work with highly modified, very high compression carbureted engines - The carbs will NOT be tunable with a stock or mildly modified engine. There are NO RETURNS with this filter. It "flows" 3-4 TRUE HP more than a stock filter and 4-5 more than a BMC Street or K&N filter, but aggravates the 8k-9k exhaust system caused reversion issue that EVERY commercially available 98-02 exhaust has had. So....That's NO FREE TECHNICAL SUPPORT!!! It IS the filter that Belgarda Yamaha used, though. So...You think you are "bad"? Make it work! YZF 1000 R1 04-06 The BEST air filter made for the R1 - Full injection molded, plastic frame!! Get the special deal - 4+ HP Velocity Stacks! !